An infant presents with difficulty breathing and grunting. Lily, a 6-week-old infant, presents with difficulty breathing, grunting, and irritability. The child had no documented fever, and no other family members at home were ill. Her mother reported that Lily made a “clicking” noise while breathing or grunting and that the child’s breathing was heavy and at times labored. The patient had not been vomiting. At birth, Lily had a gestational age of 38 weeks and weighed 7 lb 2 oz. She was delivered by cesarean section. At the initial early-discharge appointment, some minimal scleral icterus, indicating jaundice, was noted, but phototherapy was not needed. The 2-week well-child examination was normal except for dacryocystitis. At age 4 weeks, weighing 10 lb 8 oz, Lily was brought to the office because she was vomiting while breastfeeding. Ranitidine and reflux precautions were initiated. At age 6 weeks, weighing 12 lb 4 oz, she was seen in the office for “fussiness” and constipation. The dose of ranitidine was increased for the reflux, and intake of prune juice was initiated for the constipation. Within days, the patient was again brought to the office with difficulty breathing and grunting. At this latest presentation, Lily’s vital signs were as follows: temperature, 97.8°F; weight, 11 lb 15 oz; pulse rate, 185/min; respiratory rate, 44/min; white blood cell count, 9800/mm3; and SpO2, 98%. General examination: some irritability and grunting. Skin examination: no rashes. Head, neck, eyes/ears/nose/throat: normal. Chest: no wheezing, clear to auscultation bilaterally. Cardiac examination: no murmurs. Lymphatics: normal. Abdomen: some bloating, minimal tenderness to palpation, no point tenderness, no hepatosplenomegaly, bowel sounds of generalized gurgling, and generalized tympany to percussion. Based on the physical examination findings, the differential diagnosis could include abdominal pain secondary to constipation or gastroesophageal reflux, given the patient’s history, infection, or a respiratory issue with a possible abdominal cause. Lily’s symptoms rapidly became worse later in the day, and she was taken to the hospital for further evaluation and treatment. She was initially seen and admitted for respiratory distress. 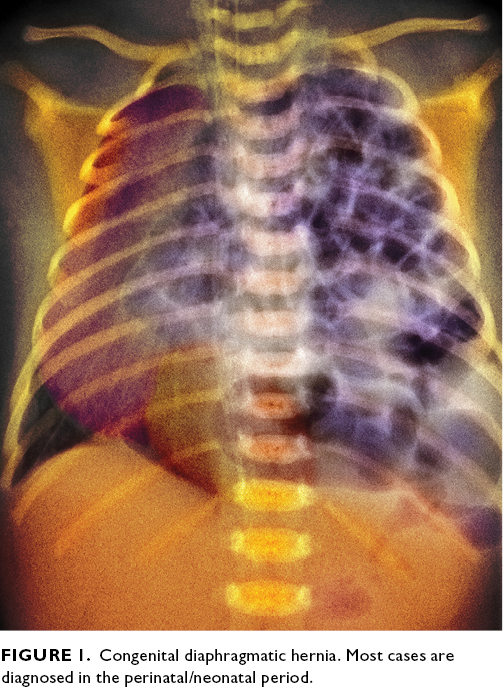 Chest radiography showed a possible congenital diaphragmatic hernia (CDH) with bowel in the left side of the chest. A pediatric surgery consultation was then obtained, and magnetic resonance imaging confirmed the presence of intestine in the left side of the chest. Medical imaging also showed an enlarged heart and a possible horseshoe kidney. The results of echocardiography and renal ultrasound were normal, except for a small patent foramen ovale noted on the echocardiogram. Figure 1. Congenital diaphragmatic hernia. Most cases are diagnosed int he perinatal/neonatal period. The treatment for CDH is surgery. In the operating room, the patient underwent thoracoscopic repair of a left-sided CDH. After surgery to repair the hernia and place the organs in normal position, she was extubated and taken to the post-anesthesia care unit, then to the neonatal intensive care unit in stable condition. By the next day, she was taking Pedialyte and breastfeeding without emesis.